This colonial hydroid species is fairly common and easily recognizable by the bright orange holdfasts (attachment structure), stems, rings of tentacles and mouths of colony members. Colonies are either male or female, and reach 15 cm in height. A key identifying characteristic of this species is the thick and distinctly ringed stems and branches of the colony. Stems and branches irregularly branched, with each polyp having approximately 16 erect tentacles. When reproductive, female colonies can be identified by small orange spheres that contain several eggs, while nearby male colonies rely on ocean currents to deliver released sperm to female colonies. Click here for more photos of this species. 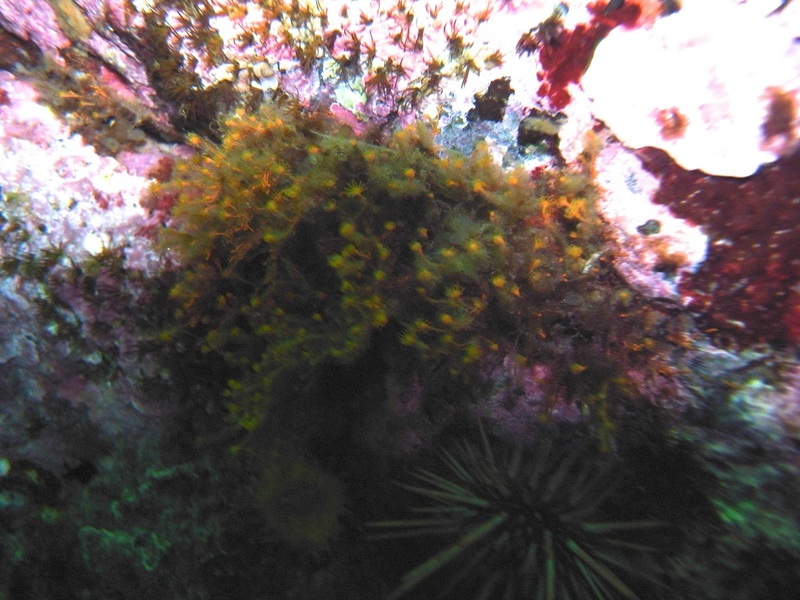 The orange hydroid can be found attached to kelp stipes (stalks), rocks, coralline algae, and sponges in the intertidal zone to depths of 120 m. Its range extends from southern Alaska to southern California. Hydroids are a common food source and substrate for egg deposition for various species of nudibranchs.